Talk about the original FFVII, the Compilation, the Remake, and other spinoffs. SPOILERS abound in here, so be prepared. I've been a fan for a hugely long time. FF7 was the first game of lengthy proportion I'd ever completed when I was a kid. I've been reading some Fan-fics of other games lately including quite a few "AU" versions, of which several were based around one thing changing which effects the whole story. I'm looking into doing something like this with FF7 but I've noticed that over the years one thing really isn't totally clear to me. Sephiroth was conceived as a normal child to a normal. It was only after she was pregnant with Sephiroth that Hojo injected both her and the fetus with Jenova cells. Genesis was injected with cells from Gillian, whom had been injected with Jenova cells whilst already an adult. I'm not entirely clear whether this was when he was still a fetus or just after birth, but either way I think its safe to assume that his birth mother was not host Jenova cells. Angeal then gets a bit more confusing. Now, I think the way it works is this. Gillian was exposed to Genova cells, and he cells were then planted into other stuff as Project G (creating Gensis). I think Angeal is a normally convieved and delivered child. He isnt injected with Jenova as a fetus or at birth, although that may happen later (when joining Soldier). He would have inherited the Jenova cells through via his natural birth mother. Then there is Soldier. As far as I understand, they are injected with Jenova cells and then bathed in Mako (or whilst being bathed, but basically, mass mako exposure + jenova cell injection). I am guessing that in all likelyhood that the three named maybe didn't actually go through that process as they already had the powers and in truth aren't actually "SOLDIERs" in the truest sense but something more. So, all 4 have Jenova cells. The two "perfect" experiments both were born from a host that contained Jenova and hence had a natural Jenova inheritance as they had always contained some Jenova. Genesis was formed purely human, although he contained Jenova by birth. So they are technically non-native cells but as they are there whilst the child is still forming in the womb probably wouldn't naturally be treated as "invader cells". Soldiers are normal humans injected with Jenova (I believe normally at 14-16 as that seems to be the time FF7 chars join army and stuff). I imagine that the Mako treatment is some way of stopping the body from fighting the cells as it would naturally want to do, as much as it is a further power boost. That's why transplanting ain't easy since even cells from other humans gets treated as an invaded and the immune system wants to attack it. Let alone if you start putting parts of a alien inside one. 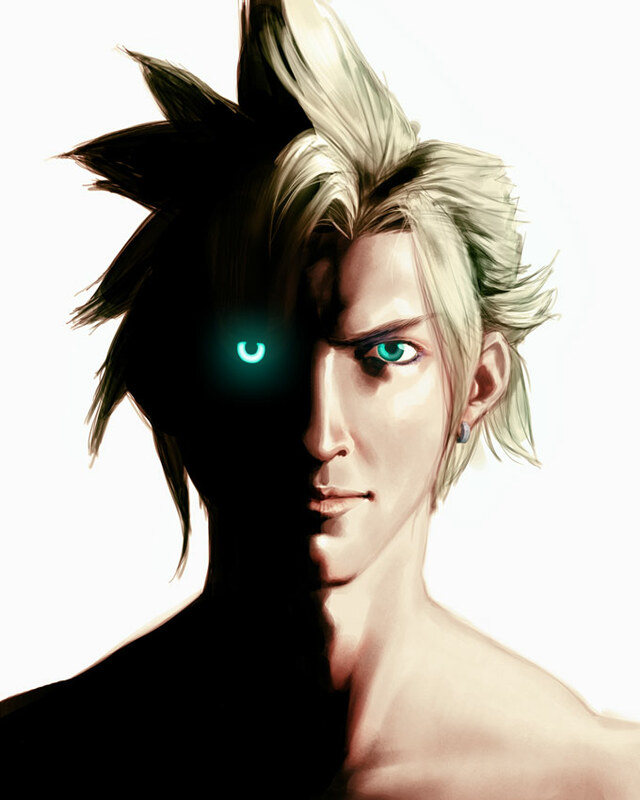 Cloud was a normal human that was injected with Sephiroth cells and them Mako treated. The same goes for the rest of the of the Niblehem survivors Hojo experimented on. Zack also underwent the same treatment. Everyone one of those bar Zack were turned basically into zombies as they were not specially picked to go through the process like normal Soldiers are and therefore were not strong or prepared enough to cope with it. Zack was selected to be in soldier and so was able to go through the process successfully and remain fully aware of himself. Whilst the rest of clones have no way to remember who they are and discarded, Cloud is kept by Zack. Zack' constant communication keeps Cloud from totally going into zombie mode and his mind absorbs that to create some sort of identity when he finally recovers enough from the Mako addiction to become mobile. He comes to just as Zack dies, which doesn't help Clouds mental state and also stops Zack being able to help Cloud remember the last few years. As he wanders and then recovers with Tifa, his mind ends up making up the story he does, but due to both Zack and Tifa's influence he is able to form an identify, which is the only real difference between him and the black cloak clones. Which i think covers the lot. I'm fairly sure that's mainly right. I imagine there are one or two other theories, but hopefully what I'm thinking isn't too far out there XD. I don't know anything about stuff that wasn't directly in FF7, but from what I can tell you are correct. Although one question I have heard asked a lot with no real answer is what exactly the test for SOLIDER is. Some say that the test is the mako + Jenova treatment itself, while others say that you don't get that treatment until after you've passed the test. This is only important because it would help explain what exactly Hojo did to Cloud and Zack in Nibelheim. Since Zack was already a SOLIDER, he would have already gone through the treatment, so Hojo couldn't have been doing that to him. But we know that Cloud has the same physical attributes as SOLIDERs, so either mako + Jenova was the SOLIDER test (meaning Cloud had already undergone it) and Hojo was performing a different experiment on the pair, or mako + Jenova came after the test and Hojo was performing two different experiments on Cloud and Zack. Just a small curiosity, but still fairly important if you're going to be worried about background details like that. To the best of my knowledge, there is no cannon explanation. Flair's explanation is probably correct. I don't have nothing to add. Hojo was injecting "Sephiroth cells" to both Zack and Cloud, trying to create Sephiroth clones from them. I would like to know what these cells might be: are they cells coming directly from Sephiroth? Jenova cells that were injected in a way so that they may emulate Sephiroth genes? The former seems more likely; but then, how exactly did Shinra get a hold of these? Did they take them from Sephiroth when he was serving SOLDIER and stocked them for later use?